Why risk not knowing? High blood pressure can lead to serious health problems. 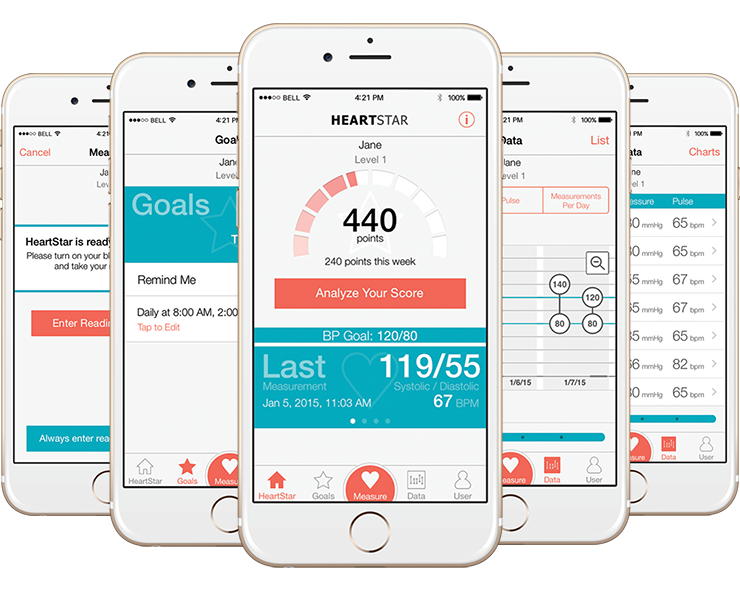 HeartStar keeps you motivated and on track to meet your blood pressure goals. Studies show that people with hypertension who monitor their blood pressure at home spend less on healthcare than those who only check their pressure at the doctor’s office. Take readings from any Bluetooth® Smart blood pressure meter and automatically sync your readings in real-time to your phone. Or, enter your readings manually. Set goals for how frequently you want to check your blood pressure and what your target reading is. Get immediate, personalized feedback on your readings and progress. HeartStar visualizes patterns in your blood pressure history to help you understand your activity patterns. View your history and trends using chart or list views. HeartStar gives you the option to automatically send readings when they are taken, whether it’s your family or physician. Your healthcare provider can use the HealthStar Portal to view your readings, or email them from HeartStar.